Born in 1948, in Latvia. Since 1967 lives in Novosibirsk. 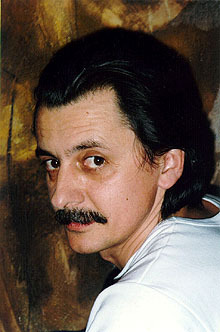 In1972 graduated from the Novosibirsk Institute of Electrical Engeneering with a degree in design. Member of the Painter's Union of Russia since 1985. Participated in more than 150 various exhibitions in Russia and abroad - in Italy, France, Great Britain, Japan, USA and several other countries. 1979 Actors House, Theater Union of Russian, Novosibirsk. 1980 Moseum of Local Lore, Novosibirsk. 1986 State Scientific and Technical Library, Nobosibirsk. 1989 Actors House, Theater Union of Russian, Novosibirsk. 1996 State Art Gallery, Novosibirsk (with Mikhail Kazakovtsev). 1997 Brumme Gallery Frankfurt, Frankfurt on Main, GERMANY. 1997 Gallery of the House of Scientiscts, Academgorodok, Novosibirsk. 1998 Brumme Gallery Frankfurt, Frankfurt on Main, GERMANY. 1998 "50/50", Gallery "Green Pyramid", Novosibirsk. 1999 "The abduction of Europe"(together with A. Shuritz), State Art Gallery, Novosibirsk. 1984 the Central House of Painters, Moscow. House of Soviet-Bulgarian Frienship, Sofia, BULGARIA. 1985 Central Exhibition Hall (Manege), Moscow. 1989 Penguin Books, Manchester, ENGLAND. 1990 the Central House of Painters, Moscow. 1991 Arts Commission Gallery, San Francisco, USA. 1994 House of German History, Bohn, GERMANY. the Central House of Painters, Moscow. the Embassy of the Russian Federation, Washington, USA. 1996 "Arte Russe contemporain", Drouot-Richelieu, Paris, FRANCE. 1997 Representation of the Russian Ministry of Economy in Germany, Frankfurt, GERMANY. Fondazine Muzeo Miniscalchi-Erizzo, Venice, ITALY.